This film is a refreshing look at SpiderMan. It isn’t like the incarnations we have seen before, Peter is younger and already in the thick of fighting crime in his local neighbourhood, Queens. 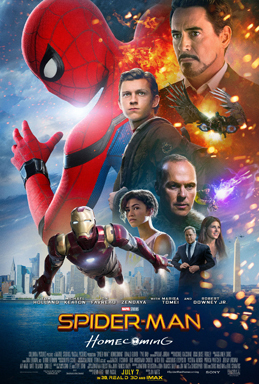 The film opens, after the scene setting, with the revamped Marvel logo accompanied by the SpiderMan theme song – I am sure I am not the only one hearing ‘Spider pig, spider pig…’ This film is set 8 years after the first Avengers film, which is several months after Civil War. In possibly one of the first cases of time continuity between films within the MCU this would put this film in at least 2020 if we go by the original assumption that Avengers is set in 2012. Kevin Feige can we get some confirmation please? This film happily includes many societal norms that are seen throughout the world, especially in such a multi-cultural area as New York. The social issues are not seen as issues but a part of everyday life – as it should be. Even a criminal played by Daniel Glover is family orientated and doesn’t want to see any trouble in the area that his nephew lives. The Vulture, Michael Keaton, is evil in the best kind of way, he didn’t want to be a criminal but life threw twists and turns at him and he adapted how he did. He is a real scene stealer at the beginning of the latter half of the film. It was lovely to see Peter Parker adapt to the Tony-suit and the bloat-ware pre-installed into it which might not be to his liking. The Karen AI was possibly on the flirty side for a 15 year old boy to have to listen too. Tom Holland is an excellent Peter Parker, someone who is both smart but knows what he himself is capable of handling mentally. In the latter respect he is mature for his age compared to his classmates, in particular Ned who believes his knowledge that Peter is SpiderMan can benefit him in terms of popularity in High School. I look forward to seeing a sequel to this film, MJ has been set up in such a way throughout this film that she will challenge Peter mentally in the future while being emotionally supportive(ish). Tony has a relatively minor role yet he appears to be emotionally stable and trying to be a better person. A returning actress adds to this. Overall this film is enjoyable either to people who are familiar with Marvel or not familiar, you might just miss some of the easter eggs throughout. Definitely worth a watch.